Leg Lifter Use to Lift and Reposition Legs With Ease. 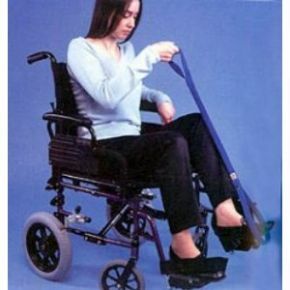 This webbing strap with stiffened stem enables the user to move a stiff or immobile leg, when using the bed, wheelchair, footstool etc. The upper loop fits around the hand and wrist, and the lower stiffened loop slides over the foot to give control in lifting the leg. Does what it says, good quality and quick delivery.